With Real Madrid fans unhappy at the club’s lowly third-place berth in the La Liga table, eight points adrift of Atletico Madrid in second and an 11-point chasm behind Barca at the summit, there have been boos ringing out around the Bernabeu for a good few weeks now. 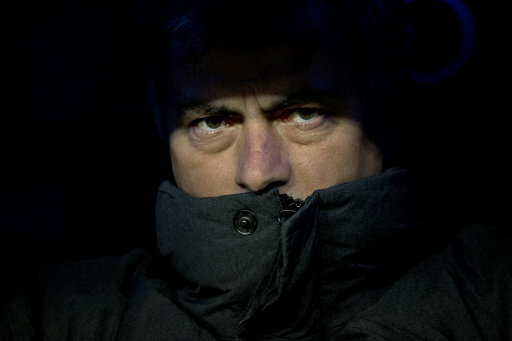 Indeed, Jose Mourinho was whistled by heckling fans during Madrid’s midweek Copa Del Rey match against third-tier side Alcoyano (they won 3-0 on the night and 7-1 on aggregate) and the Portuguese coach has had it up to *here* with their self-entitled arses – and he’s planning to do something about in his own inimitable style. “They applaud me, they whistle me, that’s life in football. I’ll go out onto the pitch (before Real’s derby game against Atletico tomorrow) at 9.20pm on my own. “Those who want to whistle me they can do it. People who come later should support their team, support their Real Madrid so that Real Madrid can achieve its objective which is to win the match. Clever girl. Instead of the fans disrupting his side throughout the evening in what will be a fairly critical game, Mourinho is going to let the boo-happy chumps get it out of their system by directing their ire at him. He’s the heel, he’s the pantomime villain and he’s more than willing to soak it all up. It’s Mourinho’s stock-in-trade. He certainly knows what he’s doing, this one. Yes, he certainly does know what he’s doing – drawing supporters’ to himself is a master stroke. Which will hopefully fail completely as Real are drowned in boos when they go down to Athleti 2-0 in the first half. Is he auditioning for the role of The Last Ninja? He better be good at walking in isometric patterns if he is.